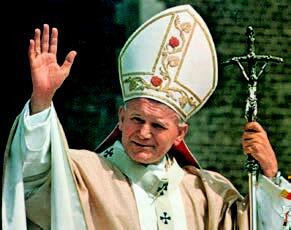 Oh, St. John Paul, from the window of heaven, grant us your blessing! Bless the Church that you loved and served and guided, courageously leading her along the paths of the world in order to bring Jesus to everyone and everyone to Jesus. Bless the young, who were your great passion. Help them dream again, help them look up to the heavens again to find the light that illuminates the paths of life here on earth. May you bless each and every family! You warned of Satan’s assault against this precious and indispensable divine spark that God lit on earth. St. John Paul, with your prayer, may you protect the family and every life that blossoms from the family. Pray for the whole world, which is still marked by tensions, wars and injustice. You opposed war by invoking dialogue and planting the seeds of love: pray for us so that we may be tireless sowers of peace. Oh St. John Paul, from heaven’s window, where we see you beside Mary, send God’s blessing down upon us all. Amen. How can we pray for you? Enter your prayer intentions using the form below.